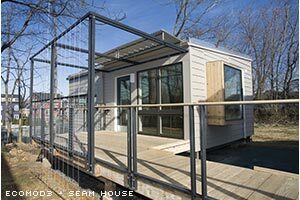 In collaboration with the University of Virginia’s School of Architecture, Modern Modular offers now a new series of homes that have been designed to encourage Net Zero, low-impact living. The homes have already won several awards for their impressive levels of contemporary design, energy efficiency, use of sustainable materials, resource efficiency, and universal design. * The Trojan Goat was winner of the Department of Energy’s Solar Decathlon 2002.
ecoMOD: three new home designs, and a trojan goat. To find the best in modern prefab home design, we look across the globe for great ideas and solutions. And across time. Driven by the idea that your house should fit your life like a glove, we begin with you, your desires and your needs, to then build a home that will set you free to focus on what’s important. NetZero Living within your reach. The ecoMOD series of homes were developed as part of a cross-disciplinary effort involving scores of academics, students and building science professionals. The homes incorporate key technologies and features that enable one to practice net zero living. It’s important to note the ‘net’ in net zero, since the technologies enable local energy generation and capture, but cannot regulate the human factor. To achieve NetZero living one needs to address two things, one is the design of the house, and the other is its ‘lifestyle’ attributes. By lifestyle attributes we mean a commitment by everybody in the household to participate and be committed (with the possible exception of the dog), to act with common sense when using appliances, lights, climate controls, etc. For many of us, that will take some learning and change of habits. Spray applied polyurethane foam insulation, blue board insulation with IR reflective coating. Birch veneer plywood, bamboo flooring, custom curtains with Thinsualte batting, glass tiles. Light emitting diodes (LED’s) tablet PC, glass panels. reclaimed car tires, wire mesh baskets, soaker hoses, and vegetables. Mirrored dish, solar tracker, glass fiber optics. Use maximum roof space for PV power generation, adjustable PV panels adapt to angle of the sun. Panel shade keeps roof cool. Plenty of openings reduce the need for artificial illumination during daylight hours, well into twilight. We achieve this with smart placement of generous windows, glass doors, and skylights. Birch veneer plywood, sustainable forests maple butcher-block countertops and desktops, plexiglass, aluminum, hardware. In order to have a meaningful discussion about your new home it’s important that you have land. Only with specific property information can we identify the right home design, permitting questions, and factors like orientation of the structure for passive solar energy use. Which design are you most interested in? Of the four designs developed by the ecoMod team which one your most drawn to? This is where we can start designing your new home. In order to begin designing your home it is helpful to have the site plan and/or map of the topography. Once you have all that in order, please contact us directly at info (at) modern-modular.com. Somebody will respond to your inquiry within one business day. © 2009 Modern Modular Holdings, LLC. All rights reserved.